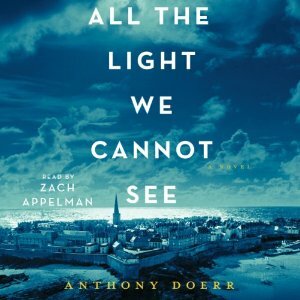 Audio Book Cover: "From the highly acclaimed, multiple award-winning Anthony Doerr, the beautiful, stunningly ambitious instant New York Times bestseller about a blind French girl and a German boy whose paths collide in occupied France as both try to survive the devastation of World War II. Taryn's Review: Initially I heard about this book through rave online reviews, so I immediately added myself to my library's wait-list. The wait time was much, much longer for the printed book (no, I don't have an e-reader...yet! ), so I opted to wait for the audio book to become available. Once it was my turn to check out the book, I was a little intimidated by the size...13 discs, many of which ended up being over an hour of spoken audio. I knew I had a time crunch since I wouldn't be able to renew the audio book, so I made listening to the audio book a priority during my daily commute. I know I'm the anomaly with my rating, but let me preface by saying that I did not hate the book. In fact, I enjoyed many parts of the book and some of the characters. That said, I am a language-lover. Great use of vocabulary strung together just perfectly is my weakness. This book was wordy, but I rarely felt like the passages or words were truly beautiful in the context of the book. Oftentimes I felt like certain words were unneeded, or that other words were chosen during a search for synonyms to substitute for more widely recognized words. For me, an example of a beautifully-written work was Rules of Civility by Amor Towles, and using it as my guideline, All the Light We Cannot See paled in literary comparison. There was also a part in the book where I questioned why exactly Marie-Laure was hiding the jewel; the author even had Marie-Laure ask herself this question, but Marie-Laure did not answer herself. Given the circumstances and Marie-Laure's ultimate fate for the jewel, I don't understand why the scenario even happened. One could argue because her father protected the jewel, but what harm would it have been to Marie-Laure to preserve her life for something her father would find less valuable than his daughter? For me, Werner was the star of the book. His insights, his growth, and his recognitions were all powerful and emotional. I wanted more Werner and less Marie-Laure as the book progressed forward. The undercurrent of fate and destiny in Werner's story was also moving...was Werner's fate sealed the moment he found the broken radio in the trashcan? Did the war interrupt Werner's future, or did the commanders that sent young Werner into the field determine his life course? Was Werner supposed to meet Marie-Laure, and if so, for what purpose? The more I listened, the more I wanted to skip Marie-Laure's chapters and stay with Werner's story. The heavy writing style also weighed down the book, and it often felt clunky to my ears. I will admit there was a flood of relief when the book was finally finished and I knew I wouldn't have to dedicate anymore time to the story. The ending of the book, and I mean the very ending, seemed incredibly blunt considered the amount of time I invested in the book. As I said, I do not hate this book, but I'm not in the camp that found this book to be amazing or rave-worthy. It's an interesting woven story of two people whose lives were disrupted by WWII and how the war impacted their futures.